The batcave playset features a working draw bridge with spinning feature to make sure the bat cycle is always ready for action, elevator, and a holding area with escape hatch. It has a shooting grappling hook, loading door that opens and closes, loading hook that raises and lowers, and a side door that can also be used with the batcycle. 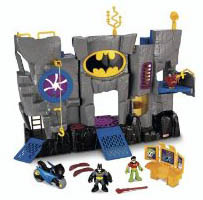 Bat cave building playset includes Batman, Robin, Batcycle, console, satellite dish, antenna, two batarangs, and bathook. The batcave toy can be folded for easy play and storage.